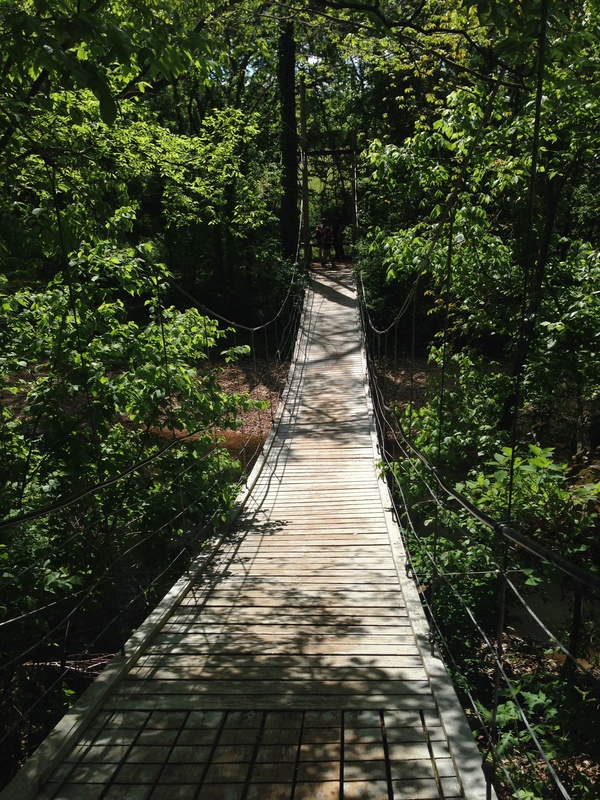 Whether living in Northwest Arkansas or just visiting, one of the greatest things about the area is the natural beauty of the Ozarks and the ease of accessing it. You don’t have to schedule an overnight float trip on the Buffalo to enjoy the scenery. A short drive can have you off the pavement in no time. After Fayetteville’s Pup Crawl on Saturday and in anticipation of the Bentonville Film Festival starting on Tuesday, we needed a break from leashed city walking. Tall grasses and deep sniffs were in order and the good bit of rain we’ve had lately had me pretty sure that a local waterfall would be at it’s peak. 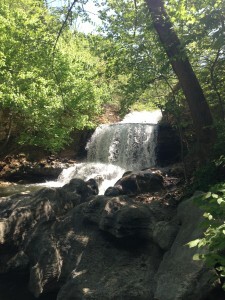 Tanyard Creek Nature Trail in Bella Vista, AR is less than a 20 minute drive from downtown Bentonville. 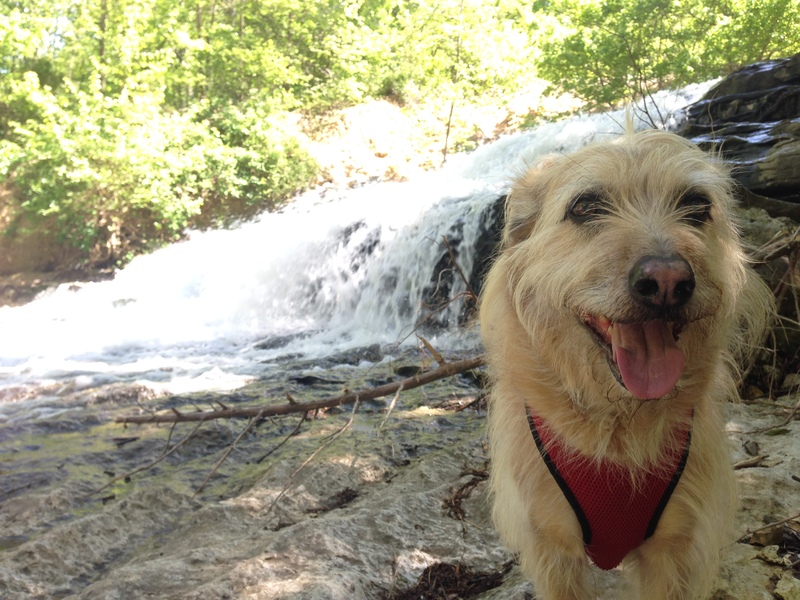 The trail is dog-friendly, complete with a water station, and boasts one of the area’s most easily accessible waterfalls. 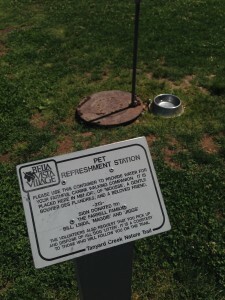 The area is well-maintained and the entire loop is only 2 miles. It’s perfect for a Sunday afternoon stroll, which was when we went. Apparently, everybody had the same idea. It wasn’t so crowded as to be unpleasant or that I couldn’t let Henri off-leash, but if you’re looking to avoid people, then this isn’t your place. It’s an easy walk, so it’s perfect for families with young kids or older adults who are no longer interested in advanced rock climbing. The trail is well-maintained and marked with metal placards describing a variety of species of plants and trees, as well as natural and man-made structures. It’s more of a nature walk than a hike. Here’s the trick to finding it: Put Tanyard Creek Practice Center and Golf Shop in your GPS. The trailhead is near the big parking lot on your right after you turn onto Tanyard Creek Drive and before you get to the golf center. If it’s a nice day, there will likely be lots of cars. You can’t miss it! There is a sign at the trailhead to point you in the right direction, except then, just a few feet further is another sign that says to go a different direction. I guess the good news is that it’s a loop so it’s hard to get lost. We just started walking. 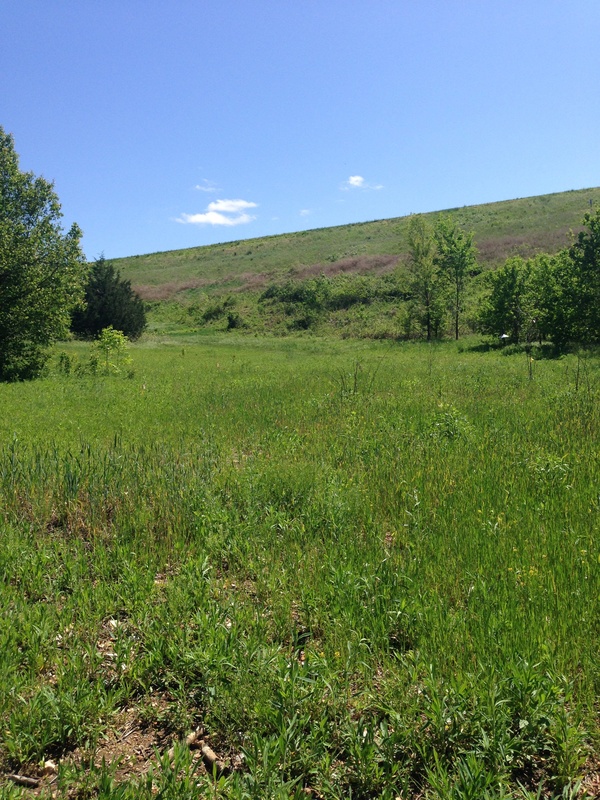 The first thing we discovered was a sprawling meadow. It really sneaks up on you because you go from parking lot to open field pretty quickly. I honestly think if Henri hadn’t been off leash and wandering, and I stopping to wait on him, we might have missed this very picturesque scene. We continued our strolling until we crossed a small bridge and then we guessed left. Good guess! We came to a fork in the path, marked by a sign that said go right to the falls. It took us straight to the man-made observation deck overlooking the falls and thanks to all the rain, we heard it before we saw it. Part of the area surrounding the observation deck is currently blocked off to foot traffic to allow for re-growth of vegetation, but if you really just HAVE to get to the falls, you can start below the observation deck and make your way through the creek bed and over the large moss-covered rocks. 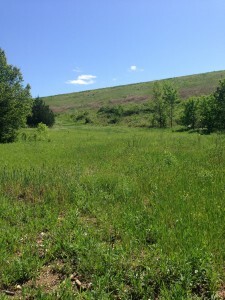 This nature trail is a great place to meander and explore. 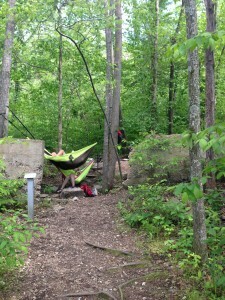 You can blithely follow the trails and creek beds, or educate yourself by stopping to read the placards. 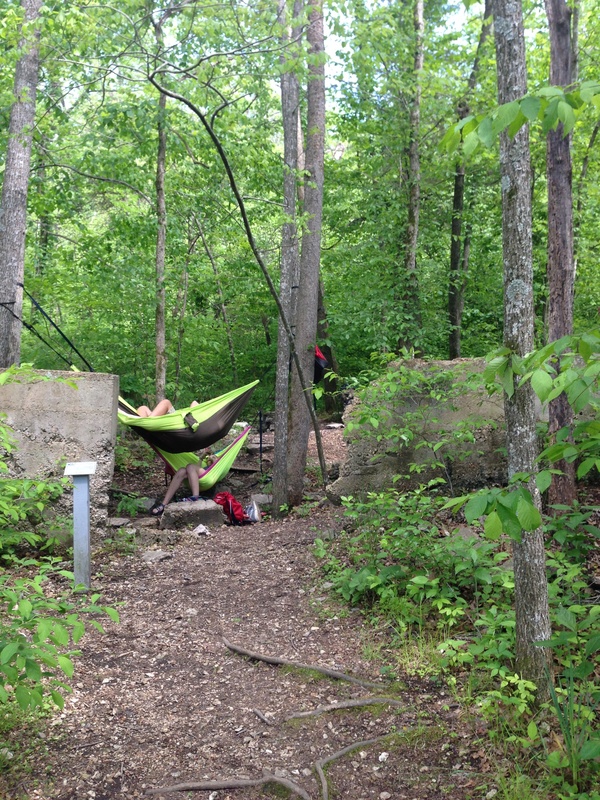 We discovered a swinging bridge and came across the foundation of an old homestead where some teens had found a great spot to tie up and sway away the afternoon in their hammocks. Remember, you’re only twenty minutes from downtown Bentonville. So after your walk, take your pooch to Pedaler’s Pub. They’ll provide your BFF with a bowl of cold water and if he’s lucky, a piece of pepperoni from the kitchen. Humans can choose from a variety of local craft beers or wines on tap, and I highly recommend the Italian pizza with prosciutto, arugula, fresh mozzarella, and shaved parmesan on a roasted garlic olive oil base. Your outing won’t be complete without a stop at Three Dog Bakery for a special gourmet treat and some snacks to go for your well-behaved, deserving pooch. You can accomplish all of this in just a few hours, but if you suddenly realize you’ve wasted an entire afternoon, don’t say I didn’t warn you. This may have been one of the neatest surprise waterfalls I’ve ever ran across. We found crawfish, tiny frogs and some of the most beautiful views. We took all the trails, and each one had something amazing to offer.